If you are growing basil from seed just for the kitchen windowsill, then you are probably only going to need to have a couple of pot full's around. That should be just enough to give you that convenient pinch for those flavoursome continental dishes. Given the right conditions basil is easy to grow from seed. However because it needs a reasonably high and stable temperature to initiate germination you only have a relatively short growing period if you live with a northern European climate and wish to grow basil outside. With that in mind, it is always best to sow basil seed indoors irrespective of whether it will end up being planted up outside or not. Start off with a couple of 4 inch, terracotta pots and fill them almost to the top with a moist seed and potting compost. You can also mix in a small handful of perlite or horticultural grit at this point to help with the drainage. Thinly sow your basil seeds over the compost surface at no more than 5-6 seeds per pot, then give them a light covering of compost or vermiculite and gently water in before transferring to a bright, warm room. Try not to allow the compost to dry out, but equally, do not overwater. Tip. To help stop compost from leaching out from the drainage hole when you come to water your basil, put a tea bag in the bottom of the pot before adding the compost. That way the tea bag acts as a ‘filter’ only allowing the water to pass through. To aid germination place a plastic bag or even some cling-film over the top of the pot to help the compost maintain its moisture and humidity, but this must be removed as soon as the new seedlings germinate to prevent fungal infection. Once the seedlings have emerged, keep them in a light position but out of direct sunlight, then once the second set of true leaves have fully formed they can be moved to their final position, presumably a sunny part of the kitchen. 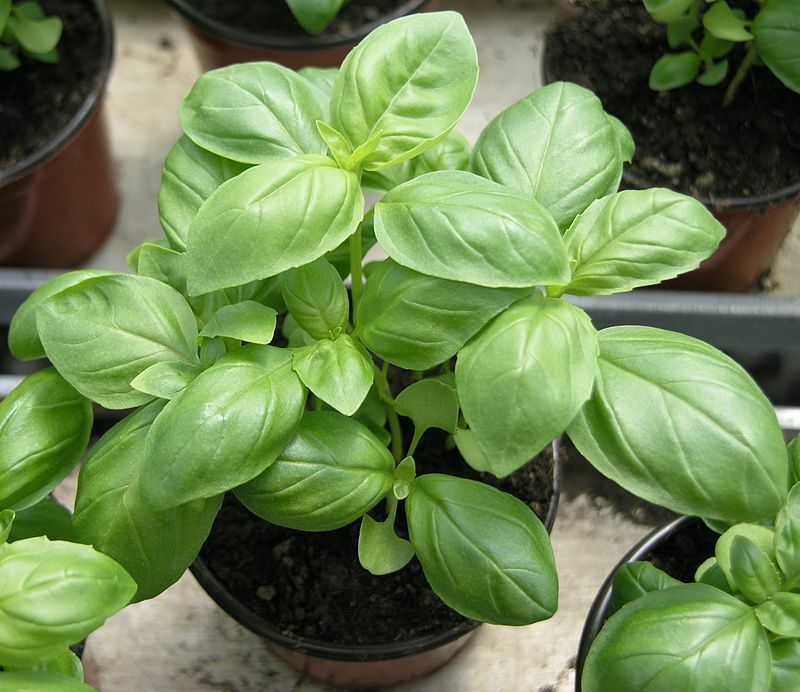 Once the seedlings have reached a height of around 3 or 4 inches, pinch out the top most leaves as this will encourage the basil plant to produce lateral shoots, helping it to bush out. As the plants continue to grow, remove any flower buds as they arise as this will signal a change in the flavour making the leaves bitter and even unpalatable for some people. Flowering will also cause a significant reduction in the growth of new foliage, reducing the amount which can be used for cooking.